Distorted teeth and improper bites can be reasons for people to lose their smile. In order to hide this deficiency, they tend to keep their lips closed, and do not smile freely. 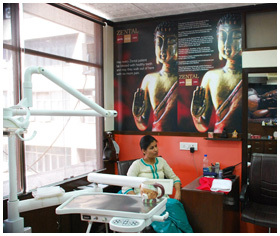 For this reason, they visit the dentist in India, who then directs them to the orthodontist. By visiting an orthodontist doctor in Delhi, people can get a number of services, in order to align their jaw-line and teeth, so that the bite alignment is restored and gaps between the teeth are closed. From basic point of view, orthodontics deals with the fixation of braces or brackets over the teeth, so that there is proper arrangement of teeth in the jaw. Improperly aligned teeth are quite difficult to be cleaned and decays occur again and again. Since they do not align properly, there are gaps and these gaps are prone to be filled up with food particles. Also, shape of the smile is quite awkward. Due to this same reason, there is extra pressure on the teeth muscles, especially on the temperomandibular joint, leading to headaches, tooth pain and even shoulder pain. After the orthodontics treatment in our dental clinic in Delhi, people get relieved from the stress of such improperly arranged dentition and also from the different kinds of diseases, have healthy mouth and pleasing appearance of teeth. In case of the upper line of teeth lying too much forward than the lower jaws, there is buck bite or buck teeth. This is called as overbite. The opposite scenario of the upper teeth going behind the lower teeth during a bite, leads to the underbite. Crossbite is also another situation in which upper teeth are not exactly slightly in front of the lower teeth, when the biting is being done. Open bite is another scenario, where the lower and upper teeth are not coming close together during a bite. These are certain defects in the conditions of bites, which need the attention of best orthodontist in Delhi for their correction. When the midline of the upper teeth and lower teeth do not fit together in the same line, then also, there is a problem of misplaced midline. Orthodontist in Delhi and other parts of India also look at the problem of spacing or gaps between the teeth or when a tooth or many teeth are missing. Crowding due to many teeth being placed close together is also a problem, which needs the attention of these specialists. How do the orthodontists work? Usually, the orthodontics treatments are done by the use of certain appliances, such as the braces. These are both fixed and removable in nature. Use of such appliances helps in closing the gap between teeth, move the teeth properly in alignment and retrain muscles, affecting the proper growth of the dentition. They work by means of applying slight pressure on the teeth, over a period of time and correct the deficiencies. Dental clinics in Delhi have the required appliances which can be fitted as braces or brackets in the patients, as per the degree of disproportion. Then again, the orthodontist doctor in Delhi has the experience and required education to determine the kind of orthodontic approach, which would best benefit the patients according to their problems. Some of the fixed appliances used in orthodontics are the braces, special fixed appliances and fixed space maintainers. These consist of bands, wires and brackets, which are bonded to the front of the tooth, which are then tightened by means of arch wires. Some of the removal appliances used by the best orthodontist in Delhi are Jaw repositioning appliances, aligners, removable space maintainers, lip and cheek bumpers, palatal expanders, headgear and removable retainers. These are important kinds of arches, splints, acrylic bases and other materials, which help in bringing the teeth closer and aligning the jaw line. In Delhi, as well as in many parts of India, there are expert dentists, who are trained in the field of orthodontics, and they look after the problems of improper bites, jaw lines and alignments of the teeth. When patients with these problems visit our clinic in India, we help them in getting the best orthodontics treatments and provide highest quality braces because we care for the dental hygiene and beautiful smiles of our patients.